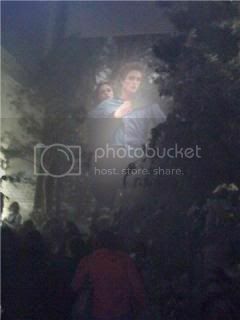 Here is a great fan report from Twilighter Tara! The organization team did a marvelous job when it comes to the 2 main halls. One was turned into “Forks Forest” (see pics) with real trees, mist, a huge Edward/ Bella pic and a green screen giving the fans the chance to get their picture taken and copied into the “Twilight”-cast picture for free! Especially the younger fans were crazy about that! The other hall invited the attendees to check out the “Forks High School Ball”, where all the live music performances (Sternenblut, a German girl group who have amazing voices and are real pros especially considering their young age!, Bobby Long, who is unreal talented and endearing) took place. The cast and bands appeared on the red carpet in time and everyone could watch their arrival on huge screens in the halls. That way it was possible for all the attendees to have a close look! The cast appeared on stage in both halls. The hosts, Collien and Jan from Viva-TV asked several questions about New Moon filming, their personal highlights etc. The interaction with the fans was fantastic, all 3 actors stayed to sign the fans´ books, DVDs etc after their on-stage time! Ashley was as beautiful and friendly as always, such a darling! When the guys got interviewed, she´d even pose for the fans and hold still so that the pics wouldn´t blur! When she was signing stuff after her stage appearance, she carefully made sure to get to the younger girls and boys (!!!) as well. It was actually planned to have Rachelle there as well but due to other obligations she couldn´t make it to Germany. She did send us a video-message and I really hope to get the chance to meet her another time and place. Ashley might have thought: “Well, if my friend Rachelle can´t make it, why not take 2 Volturi-members along?” And – really – who could turn her down? Especially if you are a man! Along came Daniel Cudmore and Charlie Bewley. The two new cast members were welcomed just as warmly as the well-known and majorly popular Ashley and seemed to enjoy their time on the red carpet and stage and also chatted with the fans for a bit. 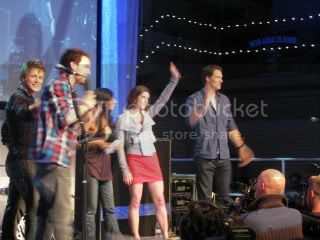 The attendees were also spoiled with the “New Moon”- trailer and some outtakes and greeting from the rest of the cast. Most of the fans in attendance were teens and tweens and I noticed that everyone was in a really chilled mood. There was not much pushing and going crazy, just lots of smiling faces and fun! The “older” people (mostly parents I´d say) supported the younger crowd (getting up front to get signatures, make sure they see enough etc. ), the cast took a lot of time to sign and have quick chats and the live music and dance performances were so suitable! Conclusion: The fan event was absolutely worth driving across the country! Berlin is a great city. Seeing the cast and party with other fans of all ages, nationalities and teams (many Jacob-fans) made me smile. I hope everyone else had at least as much fun as I had! Log in | 52 queries. 1.033 seconds.